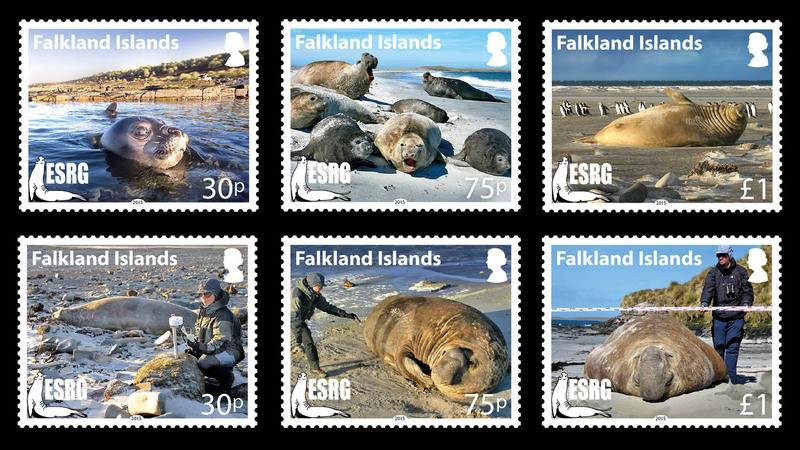 The mating system of southern elephant seals is strongly polygynous, and it is the purest form of harem based female defence polygyny. 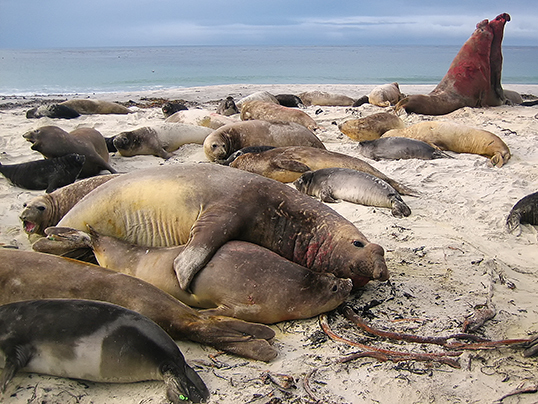 Females gather in groups while on land for parturition and suckling of the pup. This tendency to group determined the evolution of a mating system based on harems: one male holds the control of a group of females having almost exclusive access to oestrus females in the group. 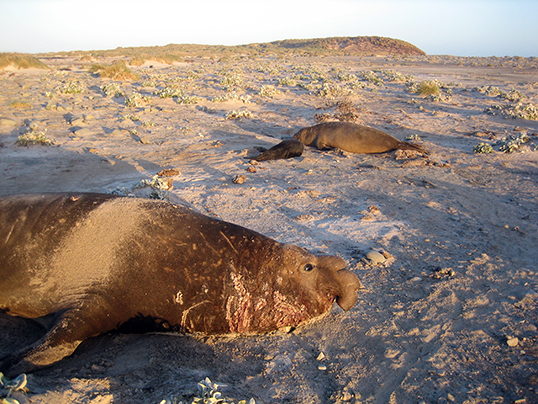 All populations of elephant seals studied until now have an harem mating system, but the size of harems, the density of males, and the level of control of the harem holder present a lot of variation. 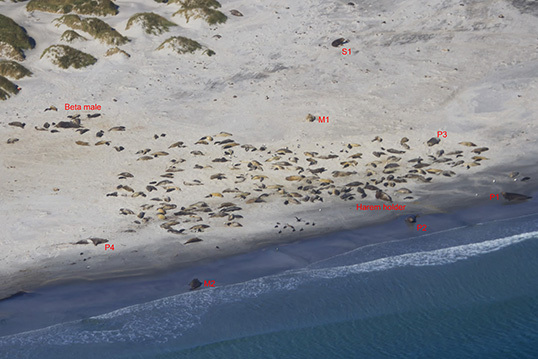 On Sea Lion Island the variation in breeding unit size is very large, and, if a female gives birth before joining an harem, she may be forced to remain isolated, in part due to the scarce mobility of pups, in part because secondary males may try to herd females to keep them away from harems. On the other side, most harems tend be larger than fifty females, and every season there are at least two harems with more than one hundred females. In these cases, the harem holder needs to be very powerful, and a good "strategist" to keep an efficient control of the harem. In most occasions, harem holders are able to effectively monopolize copulations with females as soon as they come into oestrus. 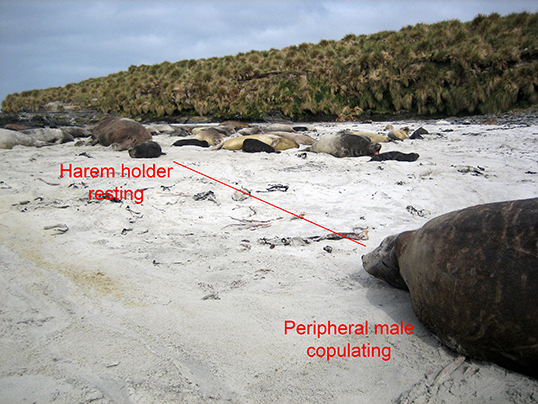 On Sea Lion Island, even holder of large harems (> 120 females at peak) are able to maintain almost exclusive mating access, doing more than 95% of all copulations observed in the harem. On the contrary, in some situation holders are less efficient, due to their lower dominance, reduced capability in managing females, or size and shape of the harem, and hence also peripheral males are able to mate with harem females.